Vegetable vindaloo is a traditional Indian dish, made with fragrant spices, tomatoes, and a variety of vegetables. Vindaloo comes from a Portuguese dish of marinating meat in wine. It became incorporated into Indian culture, and changed from wine to vinegar. 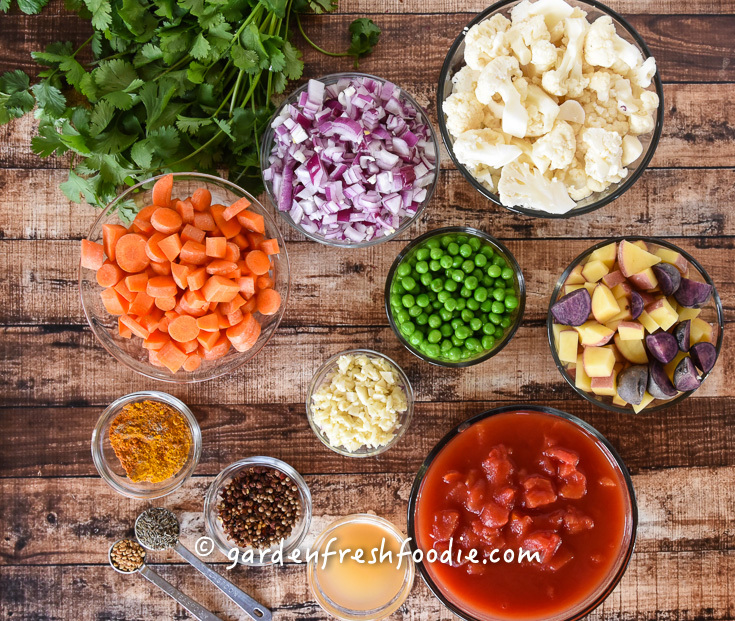 In this recipe I use traditional potatoes, carrots, and cauliflower, but you can experiment with the veggies you have on hand during the season you are in. Since it’s winter, I am using root veggies, and hardy cauliflower. In the summer, you could use zucchini, broccoli, peppers, eggplant, fresh tomatoes, and greens. If you’re not serving this along side any other dish, I’d recommend adding in some chickpeas for protein. This recipe was slightly adapted from Vegan Richa’s Indian Kitchen cookbook. It’s a FABULOUS book, and her recipes are great. 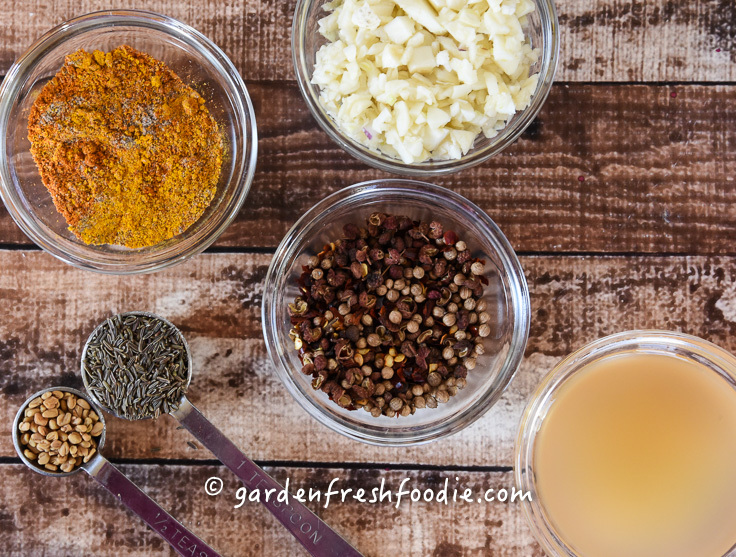 I modify by reducing salt, cutting out oil, and swapping a few spices. **I double, as I love left overs!! Two night dinners are my favorite! Serve this alongside with rice, a red lentil daal, and/or my chana masala for an Indian feast! I double all 3 of these recipes to last our family 2 nights, plus a couple of lunches. **Spices-many of these spices can be found for less money at a local Indian market. Links to a few ingredients will take you to Amazon. Keep ginger root in the freezer for long term storage. Place in a freezer safe ziploc, can be peeled and chopped frozen. 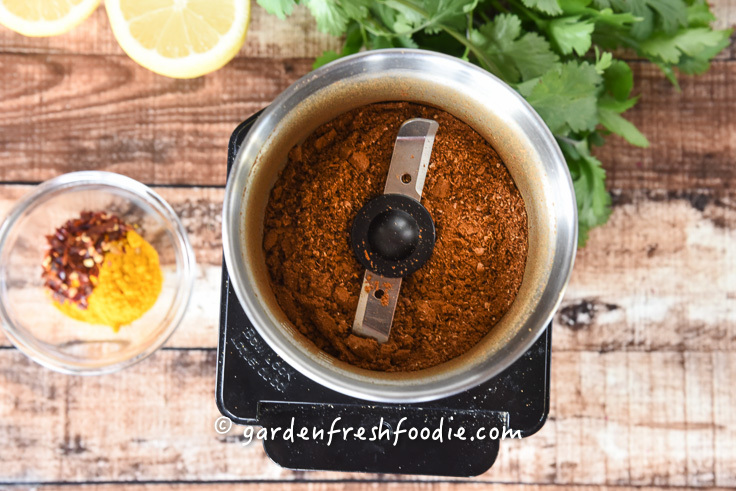 Remove spices and place into a spice grinder (coffee grinder, but if using, make sure it’s very clean or your spices will taste like coffee). Heat a heavy bottom pot, once hot, add onion, garlic, and ginger plus 2-4 tbsp water so onions don’t stick. Sauté until slightly golden. Add ground spice blend, and remainder of vindaloo ingredients except peas, cilantro and lemon juice. If needed, add a little more water. Once vegetables have cooked, and become softened, about 20-30 mins, stir in optional greens until wilted, add in peas and lemon juice. Stir to mix. 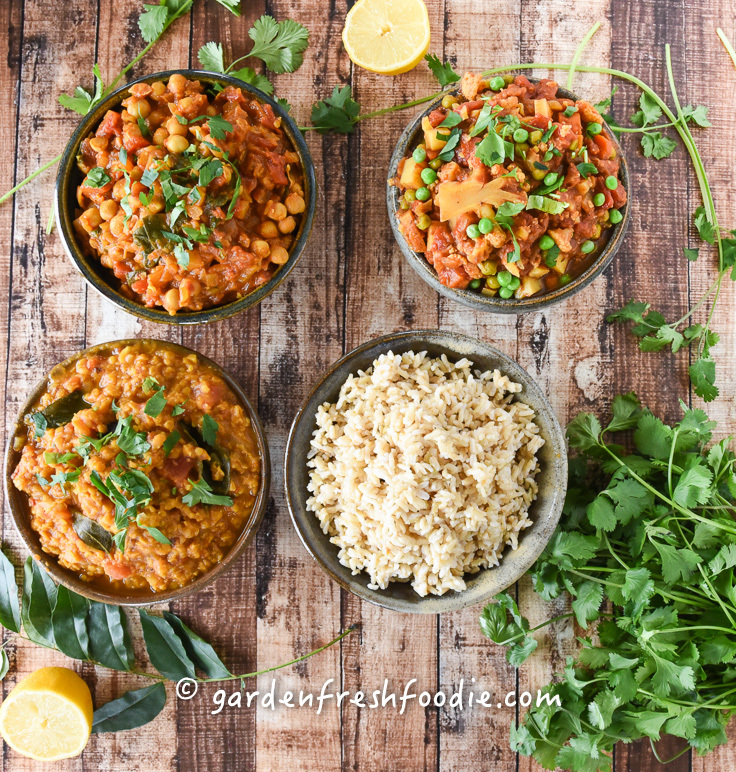 Serve over rice, alongside fresh naan, daal, and or chana masala. 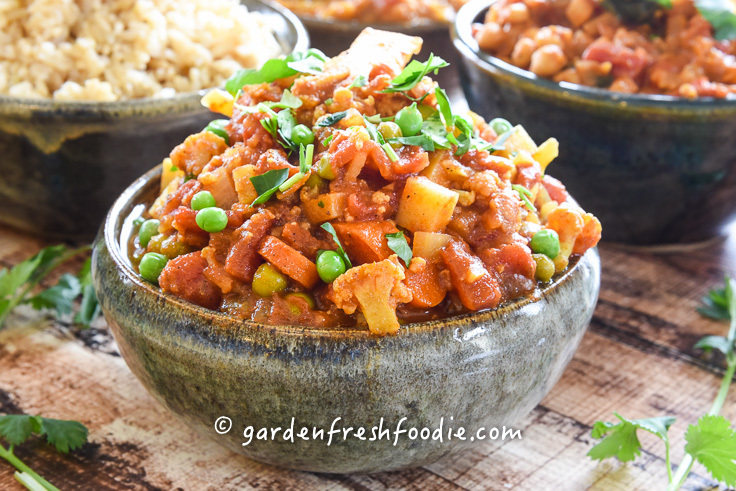 Vegetable vindaloo is a traditional Indian dish, made with fragrant spices, tomatoes, and a variety of vegetables. 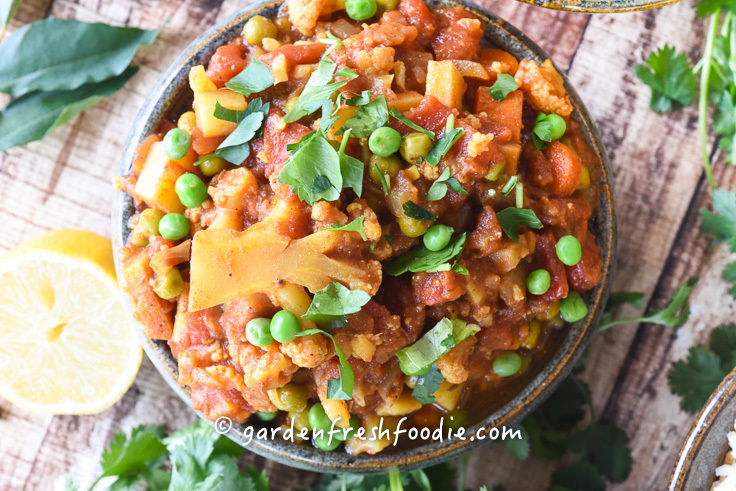 Plant-based, oil free, and gluten free Indian recipe. 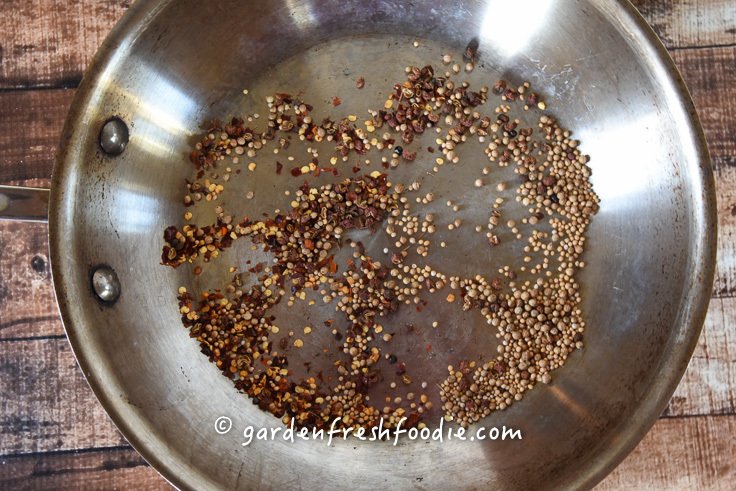 Remove spices and place into a spice grinder (coffee grinder). Heat a heavy bottom pot, once hot, add onion, garlic, and ginger plus 2-4 tbsp water so onions don't stick. Sauté until slightly golden.